As a student in the late Professor John Herman’s general ecology course, Uzair Iqbal (’16, Environmental Studies) sometimes found himself knee-deep in swamp water alongside alligators. The experience was a bit nerve-wracking, but it made a lasting impression. Iqbal has carried that lesson into his professional life. In fall 2016, he completed the research internship he had started at FGCU’s Kapnick Center at the Naples Botanical Garden the previous fall, then returned to his hometown of San Antonio, Texas, to accept a job with the city’s Solid Waste Management Department. He now serves as the Recycling Coordinator for ReWorksSA, the department’s commercial recycling division, helping apartment complexes and businesses in their recycling efforts. Happily, he notes, much of his time is spent out in the field. “I check businesses’ recycling best practices when they apply for the ReWorksSA Recycling Certification and assist apartment managers, owners and their residents with recycling initiatives,” Iqbal says. 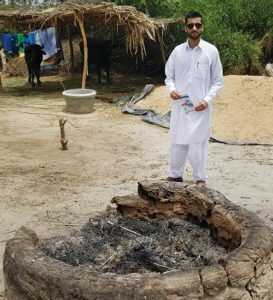 Last summer, Iqbal decided to dive into a different type of field work. He returned to his family’s native country of Pakistan for an eight-week fellowship with the American Pakistan Foundation (APF), an organization dedicated to leveraging the knowledge and resources of Pakistani Americans and friends of Pakistan to strengthen civic, political and socioeconomic ties between citizens of both nations. One of only nine fellows selected from a group of almost 100 applicants, Iqbal worked in the Water, Immunization, Sanitation and Education (WISE) program of the National Rural Support Programme, a non-government organization that has been active in rural development issues in Pakistan since 1993. His goal: to help villagers improve their sanitation systems. Now, he’s taking what he learned at FGCU – sometimes the wet and dirty way – to help his native country.